Although Alaska is often left off the travel list because of its challenging climate and remote location, Alaska is certainly where one discovers new exciting surprises around each bend in the trail, channel, or glacier. When presented with the opportunity to move to Southeast Alaska for the summer, I took it. I’m proud to say that I’m well traveled both domestically and internationally, but I found myself rather ignorant of Alaska. Although I probably should have, I didn’t do much research. So instead, I dove in. I have educated myself firsthand about this little precious piece of Alaska, which I have found over the last four months to be only the tip of the iceberg. If you enjoy adventures, the outdoors, and viewing all forms of nature up close and personal, Alaska is a dream spot. The weather presents challenges, but as any traveler knows, it is all about the gear. If you come prepared for damp, chilly, or even cold temperatures, you will enjoy Southeast Alaska. The locals say that there really isn’t bad weather, only bad gear. So yes, it rains in Southeast Alaska. In fact, little did I know that the Tongass National Forest was a rainforest. Quite honestly, I never expected to experience a rainforest in a place like this. I always pictured Costa Rica, the Amazon, or another tropical climate. Regardless, here’s a major tip – if you want to discover what this slice of heaven has to offer, bring rain gear and lots of it. Just like you wouldn’t go to the Sahara without the appropriate survival gear like head wraps, light weight breathable clothing, sunglasses, sunscreen, and good footwear, you don’t come for a good time to Juneau, Skagway, Haines, or any other Southeast Alaskan town without your rain gear. Once you are prepared with rain pants, raincoat, hood, waterproof hiking boots, or Xtratufs (the Alaska version of all weather footwear), neoprene gloves, extra socks, hat, and even a waterproof backpack, you are ready to follow in some of my footsteps or uncover some adventures of your own. Using Juneau as your base, you have many do NOT miss opportunities. My favorite, which has been my backyard over the summer, is the Mendenhall Glacier. Whether it is your first time viewing a glacier or a seasoned glacier expert, the activities available to explore, view, and take in this natural masterpiece are countless. Whether you want to go in a small group, solo, or even various times on different routes with different companions, I have ideas for you. The easiest and cheapest option is to view the glacier, lake, Nugget Falls, and the surrounding forest by foot. If you are in Juneau, you can take the Glacier Express for $8USD each way to arrive at the Visitor’s Center. I would suggest taking a few photos from the Pavilion and progressing to the Nugget Falls trail. Although these areas are still well trafficked, you can get a good feel as far as the scale of the falls and the glacier this way. To stay near the Visitor Center, you can go on a moderate hike amongst the Sitka Spruce, Hemlock, and what seems like a museum of moss on East Glacier Trail. However, if you have time or another day, I would suggest a more difficult hike on the west side of the Lake (near the Mendenhall Lake Campground), which is much less crowded. This trail allows for another perspective of the lake, glacier, and Nugget Falls. For those skilled at hiking, blessed with very dry conditions, and with hiking companions, I would suggest veering off the main trail to the unmaintained trail. This takes you to the glacier caves. There is nothing like exploring a cave of ice with glaciermelt and streams flowing all around you. The ceiling of the cave appears like the sky. However, I must caution you that going and returning on the rocky, slick trail requires much care and great hiking boots. As always, be prepared with good gear, lots of water, snacks, and safety items such as a whistle. For those adventure seekers that have a larger budget, there are various tour companies that offer helicopter flights to view the Juneau Ice Field as well as a pit stop on the Mendenhall Glacier for a short, guided walk. I would recommend calling TEMSCO helicopters, which flies out of the Juneau airport seven days a week for numerous flights to the Mendenhall Glacier. This includes a 30-minute guided tour on the glacier with the opportunity for viewing crevasses, tasting glacial water from a stream, taking pictures, and trekking around with glacier boots. The cost is per person and around $250-275USD. Tuesday and Wednesday are the busiest days. Try to aim for later in the week or even over the weekend. There are over 250+ miles of hiking trails in and around Juneau. However, there are only about 40 miles of roads in Juneau. So when in Juneau, do like Juneauites, hike. Once you have explored the area around the Mendenhall Glacier, I would suggest two hikes that are near Juneau’s downtown: Mount Roberts and Perseverance Trails. The first, Mount Roberts Trail, allows for firsthand exploration of what a rainforest looks and feels like on a moderately difficult upward hike to the Mount Roberts Tram, restaurant, and gift shop. On this hike, you will truly experience the lush rainforest, which includes a little mud, devil’s club, waterfalls, and moss covered everything; that means you as well if you don’t hike fast enough. As a reward, follow the hike with a warm pit spot at the top before the five-minute tram ride down. You can enjoy the best views of the Gastineau Channel at the overlook with an opportunity to relax in the restaurant and bar with a meal, appetizer, or just a local beer. Once you have experienced the lookout and restaurant, the tram ride down to the docks and downtown is free (as long as you purchase $10 of food or gifts while at the top). If you have travel companions that choose not to hike, they can go up and down the tram to join you – it is $27 per person. The hike takes about an hour and fifteen minutes to the top, depending on your fitness level as well as what you are carrying with you. Although there is an official trailhead off Basin Road, I would suggest taking the local entrance at Gold and 6th Streets, follow the steps, and begin your hike. This is just minutes from the Juneau International Hostel, Silverbow Inn, all of downtown Juneau, and the docks. The second, Perseverance Trail, is the most gradual and pleasant trail that I have experienced in and around Southeast Alaska. Starting at the end of Basin Road, roughly two miles from downtown, generally up steep, narrow Juneau streets, somewhat like San Francisco, you arrive at the trailhead of Perseverance. Although the name is quite scary, it is a gentle three-mile hike to the end or six miles roundtrip. The entire route is following an old mining trail, which is wide enough for park vehicles and well maintained with much gravel and good bridges. The elevation gain is little, but the views are nothing less than amazing. You will follow the old mining road through the valley, primarily cut by the snowmelt, its river, as well as the mining itself. Along the way, there are various twists and turns where you will have shutterbug wet dreams with cascading waterfalls, soothing streams, and even eagles, or their mighty rival in these parts, ravens, soaring effortlessly hoping to beat the competition to the next meal, perhaps a spawning salmon. The hike takes about two to three hours each way; however, if you would like to cut your hike in half, I would suggest turning around at Granite Creek Trail. Once you finish your hike, you can visit the Old Gold Mining Museum or head back into downtown to visit a few of the great drinking and eating establishments – the Red Dog Saloon for a drink and Tracy’s Crab Shack for a combo – king crab leg, crab cakes, and crab bisque. It is no joke! You live amongst the wildlife in Alaska. Even in Juneau and other larger towns, you have to be aware. Some of my best wildlife spottings have been completely random on daily errands whether on foot or bike. I would say the easiest way to view black bears, salmon, and eagles in the summer in Juneau is near the Mendenhall Visitor’s Center. Along Steep Creek, there are a mother and cubs that feast on the spawning Coho and Sockeye salmon. In fact, this mother has been returning for various years. For your best viewing of both salmon and bears, you should plan for later in the afternoon or evening. This is when the majority of the tour buses leave and the mother and cubs feed. For those who would like to go on a bear-watching excursion, there are private and group tours to Admiralty Island, where bears outnumber humans. However, these tours are almost a full-day roundtrip by floatplane from Juneau, limited in availability because of permitting, and rather expensive $650+ per person. 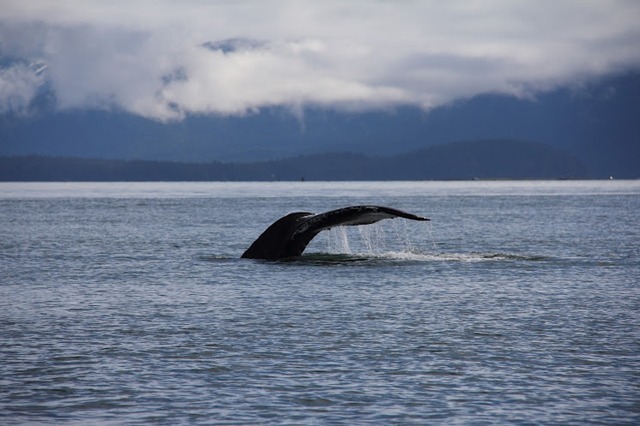 Another amazing experience when visiting Southeast Alaska is whale watching. At the beginning of this summer, I was a virgin to spotting whales in the wild. I had visited SeaWorld in Florida when I was a child, but I had never seen a whale, let alone pods of them in the wild. On my first whale watch, I was privy to see roughly five humpbacks. Their waterspouts easily allowed us to spot them. Upon surfacing, a large, sometimes 30+ feet high blast of air and water shoots up from its blowhole as the whale takes another breath for a dive down to feed. Typically after a series of four to five of these breaths, a whale dives deep to feed on krill and even mackerel. On the final breath a mature humpback will curve its back a bit more, warning you to get your camera ready. Within moments, the gorgeous fluke shot that you have been yearning for can me made. Fortunately for me, on that same maiden voyage, I was blessed with the rare opportunity of seeing a pod of Orca whales (aka Killer whales). Unlike Humpbacks, who frequent these waters all summer, only about 10% of the time do the whale watching boats see Orcas. After just reacting like a curious, wide-eyed kid on my first whale watch, I had to repeat. Yes, I’m a serial whale watcher. I have ended my summer in Alaska with five whale watches under my belt. I would highly recommend one operator for a more independent experience – Harv and Marv’s. This family-run operation has a fleet of smaller vans and boats. Each group is roughly six people and a captain. 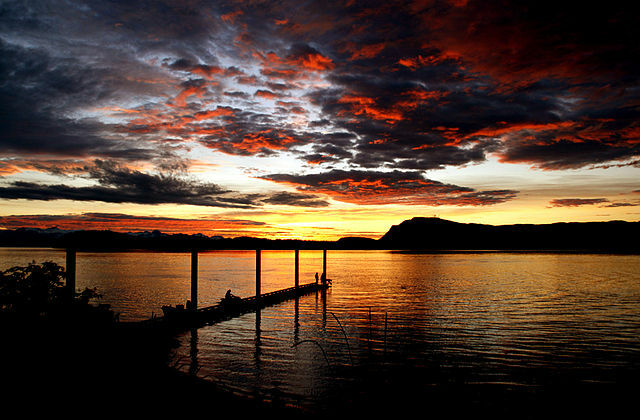 They will pick you up at the dock in downtown Juneau, at the Mendenhall Glacier, or even your private home, hotel, or campsite to take you to the Auke Bay Harbor. There you will board your smaller vessel for a three-hour tour of the Lynn Canal. The cost is comparable to the larger whale watching boats, but you have a more quaint experience with the opportunity to take beautiful shots without another tourist in your frame. Another first this summer was seeing my first fjord, Tracy Arm, by boat. Before, I had read articles about fjords. I had seen beautiful pictures of Norwegian fjords as well as practiced pronouncing fee-YOurd like a good Nor-WEE-gian. However, I had no idea how powerful viewing one in person could be. Aboard Adventure Bound, I left Juneau for an all-day, nine-hour roundtrip excursion on boat. 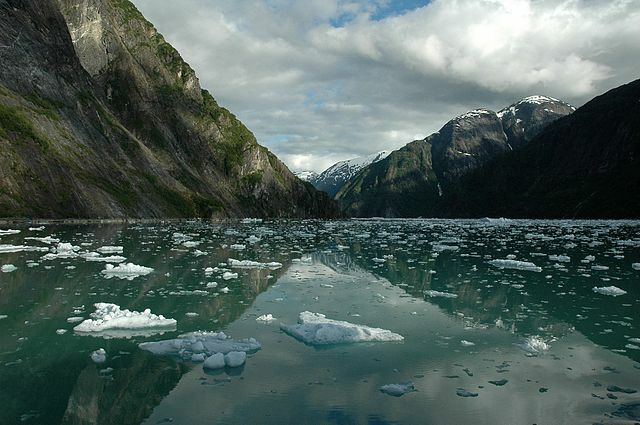 We traveled south on the Gastineau Channel to the Tracy Arm Fjord. We then traveled more than thirty miles into the chiseled fjord passing various waterfalls, nearly escaping a couple of floating icebergs, and finally arriving to view the Twin Sawyer glaciers. Because both glaciers were tidal glaciers or facing the sea, they calve. 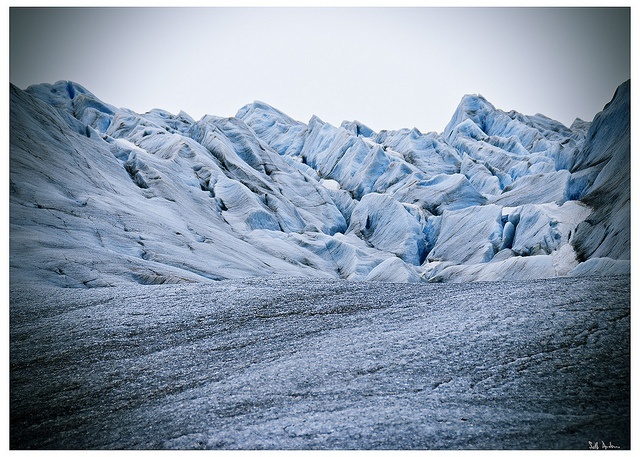 It is as if the process of ice falling from the glacier into the water is like giving birth. And, luckily for me, I was witness to various calvings at both glaciers. As a warning, the sound is just startling. The break’s volume is magnified by the water, the fjord’s granite cliffs, and the glacier itself. Then once the ice falls, there is an aftershock, a wave of ice-cold water that surfaces before the actual calving itself. After calving, that chip or block of ice is renamed as an iceberg, where 80-90% of it is submerged. This is a real danger to boats, but a convenient shelter for Stellar Sea Lions and birds. Plus, it is a magnificent hue of blue. It has taken me four months to uncover just a piece of the Alaskan experience. I now understand that the Last Frontier is vast, much of it undiscovered. It has opened my eyes to many natural wonders I had yet to see anywhere else in my worldly journeys. Alaska is a beautiful place. A place I’ve come to love in spite of and because of its challenges whether climate, distance, or the pace that these challenges set. I must admit that just like an iceberg that is mostly submerged, I believe that the majority of Alaska remains for my future explorations and adventures. Alaska is truly a marvel of nature. I had the opportunity to visit and stay a while. I took it without question. And, I certainly would repeat it. Don’t let the distance or climate hamper your discoveries. Come to Alaska. You will be awe-struck with its power, vast space, kind people, and what I would describe as nature on steroids. Mendenhall Lake Campground – Affordable, best views of the Mendenhall Glacier, Lake, and Nugget Falls. As this is located in the Mendenhall Valley off of Mendenhall Loop Road, it is the closest accommodation to hiking with West Glacier Trail within a short walk. It is about a mile for the nearest bus stop, but you can either rent a car or bike for easy transport. Silverbow Inn – Located in the heart of downtown, this inn and B&B has breakfast, lunch, and dinner. It’s most famous for its bagels and breads (I love carbs t-shirts are available). Plus, you can chill in its cozy dining area with free Wi-Fi. Juneau International Hostel – The only hostel in Juneau is located in downtown, close to the Mount Roberts trailhead and other sites. The rates are reasonable ($12 per person + a chore); however, there are curfews for those of you interested in closing down South Franklin Street’s bars. Best Western Grandma’s Feather Bed – Located in the Mendenhall Valley close to the airport, it is only 2-3 miles from the Mendenhall Visitor’s Center. This is a good place if you have rented a car, plan to rent a bike, or choose the public bus. Glacier Express – No frills, inexpensive ride to and from downtown to the Mendenhall Glacier Visitor’s Center. The cost is about $16-$20 roundtrip. TEMSCO Helicopters – Best helicopter tour company in Southeast Alaska with flights to Mendenhall Glacier 7 days a week. Harv and Marv’s – A personalized whale watching company running out of Auke Bay harbor, but they will come and pick you up in downtown at the Mendenhall Glacier or other location. Tracy’s Crab Shack – King crab legs, crab cakes, crab bisque, and drinks. Find yourself a table under the awning and roll up your sleeves. Get the combo, which includes one leg, four crab cakes, and a cup of crab bisque for roughly $35 depending on market price. Hangar – Where the locals eat! This restaurant and bar has views of the Gastineau Channel with floatplanes landing frequently right in front. It used to be the Juneau airport. The food and atmosphere is casual. The prices are moderate. Twisted Fish – A sister restaurant to the Hangar, the Twisted Fish is right next to the Mount Roberts Tramway. It offers the best in fresh fish and seafood with an upscale yet casual ambiance. It is noted for having the largest wine bar in Southeast Alaska. The Alaskan – A turn of the century hotel and bar located on Franklin Street in downtown Juneau. The Alaskan Bar has some of the best live music in the area. Squire’s Rest – A casual bar with darts and pool tables overlooking the Auke Bay Harbor. This is close to the University as well as Fisherman’s Bend. The crowd is a mix of locals and students. Alaskan Brewing Company Tour – Either pick up a depot shuttle from downtown or drive to its Lemon Creek location for a free tour of the brewery, its history, and most importantly, six of its finest brews ranging from Summer, White, Smoked Porter, Amber, and more. Red Dog Saloon – An old-fashioned saloon with sawdust floors and one-man bands. It’s a place to grab another Alaskan Amber and take a picture. Alaska Marine Highway – The way locals in the Southeast get around. You can purchase tickets for open seating or sleeping quarters. For those that enjoy watching wildlife and experiencing the open waters, do get lounge chairs in the open-air solarium. You can also bring tents and camping gear, but depending on the season and timing you may just want your sleeping bag. Prices and schedule vary depending on with or without a vehicle as well as destination. Capital Transit – The local bus transit is $2.00 per ride. You can pay cash, coin, or with tokens that can be purchased at the local public libraries. The bus does carry two bikes if you are biking. A ride into Juneau from Auke Bay or Mendenhall Valley has numerous stops. The ride takes about 45+ minutes each way. Taku Taxi – Local Juneau taxi company with majority of mini-vans for picking up larger groups as well as transporting shopping and/or bikes. Cycle Alaska – Downtown Juneau bike tour, rental, and repair shop. You can join one of their daily tours or rent a bike for a half day, day, or longer. Beginning of May to the end of September is the ideal time to visit.